The 2018 edition of our International Users Conference was a great success, with 232 participants from 91 automotive and transportation companies, universities and research centers from 15 countries from all over the world! 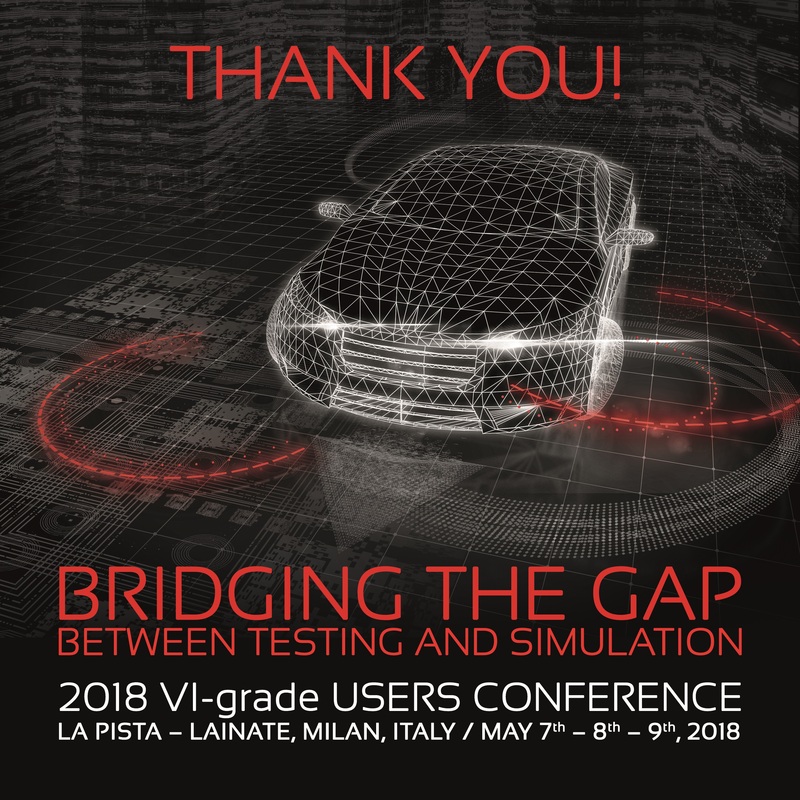 The event, dedicated to executive managers and experienced engineers belonging to the main automotive and transportation companies, universities and research centers from all over the world, took place on May 8th-9th, 2018 at the LA PISTA conference center and proving ground, located in the city of Lainate, Italy (in the outskirts of Milan). The selected location, featuring a proving ground embedded in the conference venue, provided an ideal setting for all presenters and participants to elaborate on our corporate vision of “bridging the gap” between testing and simulation. The conference offered to the VI-grade international users community the possibility of discussing the latest simulation trends related to system-level virtual engineering, hardware-in-the-loop, controls and driving simulation. Particular attention has been given to VI-grade’s current solutions and development plans for real-time simulation, HIL, SIL, traffic simulation and ADAS. The event offered keynote and technical papers as well as an interesting technical showcase area in which VI-grade and its partners presented their solutions. The 2018 event also featured an Ice Breaker social event in the evening of May 7th, where all customers/partners informally got together to learn more about the new and forthcoming driving simulation technologies provided by VI-grade and partners. The presentations included contributions from: 3D Mapping / Alfa Romeo / Applus+ IDIADA / Bertrandt / Concurrent Real-Time / cosin scientific software / Danisi Engineering / dSPACE / FCA Fiat Chrysler Automobiles / FCA Latam / Ferrari & Michelin / FEV / Fraunhofer ITWM / Hochschule Kempten / Honda R&D / HORIBA MIRA / MAGNA Steyr / MegaRide & Università degli Studi di Napoli Federico II / MSC Software / Munich University of Applied Sciences / NIO / Nizhny Novgorod State Technical University / Saginomiya / Smart Eye / Technische Universität Darmstadt / thyssenkrupp Presta / TODEMA / Toyota InfoTechnology Center / Università degli Studi di Modena e Reggio Emilia / Volvo Cars. ​Selected conference proceedings are available here.